Late last week SeaWorld made a grand announcement: it is going to expand the orca facilities at all of its theme parks. The development plans, branded with the title "Blue World Project," will see orca tanks nearly double in size. 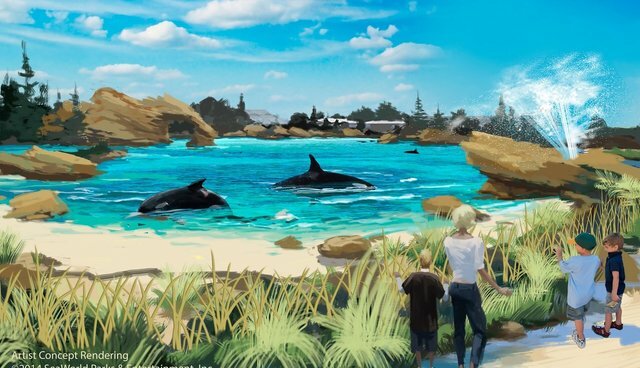 SeaWorld also promises to ensure the tanks will be built to resemble a more natural-looking environment. The first refurbishment aims to be completed in 2018 at SeaWorld San Diego, featuring a $10 million, 50 feet deep tank spanning 350 feet in length. The big reveal of these ambitious new plans came shortly after SeaWorld released their most recent stock figures. In the aftermath of what is being referred to as "The Blackfish Effect," denoting the negative PR the sea parks are receiving following the 2013 documentary, SeaWorld's stock has taken a serious dive. It is down 45 percent on the previous years' figures, and attendance rates have fallen by 4.3 percent. Although SeaWorld representatives have downplayed a connection between publishing the recent stock figures and advertising new development plans, the timing is obvious. Instead of reading "The End of SeaWorld" (August 14, The Dodo) the headlines rather conveniently changed to "Sea World unveils new orca habitat" (August 16, Sydney Morning Herald). However, they may as well have read, "SeaWorld completely misses the point." As David Perle, spokesman for People for the Ethical Treatment of Animals (PETA) responded to the news, "A bigger prison is still a prison." Perhaps the most concerning aspect of these revelations is that instead of cutting its losses or downscaling aspects of its operations in light of a change in public opinion, SeaWorld are expanding. The expansion represents an emblematic, aesthetic change instead of any real transformation. Blue World Project is a superficial gesture, to say the least. It also makes any possibility of authentic, positive change seem further out of reach. As Blackfish director Gabriela Cowperthwaite argues in relation to SeaWorld, "the problem is, instead of changing their business model, they're doubling down." The unwillingness to alter an archaic business model also means SeaWorld will be able to increase, or at least maintain, their captive breeding programs. Cowperthwaite makes the conjecture, "it seems pretty clear that the new pool size is designed to accommodate more captive whales and more forcible breeding." SeaWorld is not just expanding tanks, but also looking to extend its brand and business model overseas. Australian film studio and theme park operations company Village Roadshow has signed a letter of agreement to actively help the theme park expand on an international level. It seems SeaWorld is more focused on fixing a damaged reputation and improving flailing stock prices than addressing the underlying issues associated with keeping killer whales, and cetaceans, in captivity. These problems range from high mortality rates and chronic health issues to hyper-aggression between captive animals, and the ethics of exploiting animals for profit. Building a larger tank will not solve any of these issues. Orcas in the wild can swim 100 miles a day and dive to 1,000 feet. No matter how big the tank, it could never provide an environment in which a whale or a dolphin could live and behave naturally. A tank does not even begin to replicate the ocean. If SeaWorld is really trying to positively change their image to a more ethically friendly and conservation based organization, they are going the wrong way about it. As Robert Mann, reporter for Adweek, states, "if SeaWorld hopes that repositioning itself as a conservation-minded brand (and not an oceanic circus where killer whales perform acrobatics in tight quarters), it's headed for disappointment." There is an alternative. This week the National Aquarium at Baltimore assured the public it was still in talks to create the first seaside dolphin sanctuary in the U.S. If all goes ahead, and following careful planning and research, the aquarium plans to relocate it's existing eight dolphins to an open water pen, making sure they remain together. Visitors to the aquarium will still be able to view and interact with the dolphins through a web-based video-conferencing program such as Skype. What SeaWorld doesn't seem to grasp is that a bigger enclosure does not equate to a better standard of living – a tank is still a tank, no matter the size. I work with Australia for Dolphins, a non-profit with a strong opposition to dolphins and whales in captivity for commercial purposes. We are working to stop the unthinkable cruelty of dolphin hunting, and believe the two issues are interconnected.